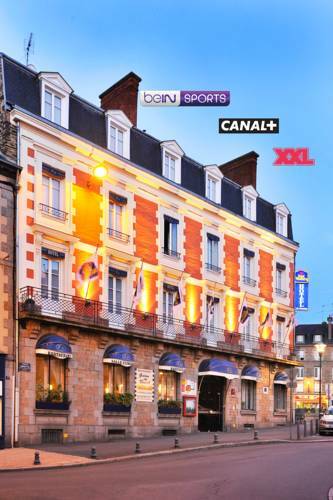 Here is the list of the hotels near Luitré. Book your hotel near Luitré today, Tuesday 14 May for the best price, reservation and cancellation free of charge thanks to our partner Booking.com, leader in on-line hotels reservation. Below here is the list the 50 closest hotels of Luitré, sortable according your criteria. You will find the position of these accommodations on the Luitre hotels map. Offering an outdoor pool, La Jeusseliniere is located in Larchamp. Free WiFi access is available. Each room here will provide you with a TV and satellite channels. There is also an electric kettle. Featuring a shower, private bathroom also comes with a hairdryer and free toiletries. Extras include an outdoor seating area, bed linen and ironing facilities. Restaurants and bars can be reached within walking distance. At La Jeusseliniere you will find free bikes. An array of activities can be enjoyed on site or in the surroundings, including cycling. The property offers free parking. Rennes Airport is 63 km away. Featuring a garden with a seasonal outdoor shared pool, Jolie Grange is a detached holiday home situated in Larchamp in the Pays de la Loire Region. The property is 49 km from Le Mont Saint Michel and free private parking is offered. Free WiFi is featured throughout the property. The kitchen comes with a dishwasher. A flat-screen TV and PS2 are provided. Other facilities at Jolie Grange include a barbecue. Free use of bicycles is available at the property and the area is popular for cycling. Bagnoles de l'Orne is 48 km from Jolie Grange, while Laval is 36 km away. The nearest airport is Rennes Airport, 63 km from Jolie Grange. La Petite Jeusseliniere is located in Larchamp. Free WiFi is featured. This holiday home has 1 bedroom, a satellite flat-screen TV, and a kitchen with an oven. Laval is 42 km from the holiday home. The nearest airport is Rennes Airport, 80 km from the property. Surrounded by its 3000-m² park, Gite de Peche is a traditional stone-walled house with BBQ facilities and a fireplace all 1 km from the village of Saint-Ellier-du-Maine. This holiday home is a 40-minute drive from Rennes. This three-bedroom villa features both parquet and original checkered tiled floors, a washing machine and flat-screen TV. The spacious living room comes with a period furnishings and the bathroom is complete with a hairdryer. An array of activities can be enjoyed in Gite de Peche's surroundings, including fishing. The holiday home is 15 km from the Fougères Castle. Rennes Airport can be reached in 55 minutes by car. Le grand cerf offers pet-friendly accommodation in Ernée. Guests can enjoy the on-site restaurant. Free private parking is available on site. Le grand cerf features free WiFi throughout the property. There is a shared lounge at the property. You can play billiards at the hotel. Bagnoles de l'Orne is 47 km from Le grand cerf, while Laval is 28 km from the property. Rennes Airport is 65 km away. Two-Bedroom Holiday Home in Montaudin is located in Montaudin. Guests staying at this holiday home have access to free WiFi. The 2-bedroom holiday home comes with a living room with TV, and a fully equipped kitchen. Laval is 44 km from the holiday home, while Vitré is 41 km away. The nearest airport is Rennes Airport, 84 km from the property. Featuring a garden, Mon Pré Vert is a detached holiday home located in Saint Ellier du Maine in the Brittany Region. The property is 42 km from Le Mont Saint Michel and boasts views of the garden. Free WiFi is offered throughout the property and free private parking is available on site. The kitchen is equipped with a dishwasher, an oven and a microwave and there is a private bathroom. Towels and bed linen are available in this self-catering accommodation. Other facilities at Mon Pré Vert include a barbecue. Bagnoles de l'Orne is 48 km from Mon Pré Vert, while Laval is 43 km away. Rennes Airport is 65 km from the property. Set in Montaudin in the Pays de la Loire region, Forgelle features a terrace. The property has garden views. The holiday home features 2 bedrooms, a flat-screen TV and a fully equipped kitchen that provides guests with a microwave. Laval is 45 km from the holiday home. Rennes Airport is 85 km from the property. Located 1 km from Pontmain and 16 km from Fougères, Gîte La Loussaudrie is a south-facing, semi-detached holiday home with free WiFi and free parking. A private garden with outdoor furniture is available. The rooms are located on a mezzanine and the bathroom is fitted with a shower. A dishwasher and an oven can be found in the open kitchen and there is a private bathroom. Guests can relax by the fireplace of the living room which features a TV. You can play table tennis at the property, and the area is popular for cycling and hiking. Le Mont Saint Michel is 40 km from Gîte La Loussaudrie, while Laval is 46 km from the property. The nearest airport is St Jacques Airport, 64 km from Gîte La Loussaudrie. Located in Saint-Denis-de-Gastines, Le Hutereau - Chenin provides accommodation with a private pool and pool views. With garden views, this accommodation features a swimming pool. The 1-bedroom holiday home features a living room with a flat-screen TV, a fully equipped kitchen, and 1 bathroom with bath. The holiday home offers a terrace. Guests can relax in the garden at the property. Laval is 40 km from Le Hutereau - Chenin, while Vitré is 37 km away. Rennes Airport is 87 km from the property. Sauvignon is located in Saint-Denis-de-Gastines and offers free bikes and barbecue facilities. Featuring garden views, this holiday home also comes with free WiFi. This 3-bedroom holiday home comes with a seating area, a satellite flat-screen TV and a kitchen with an oven. The holiday home offers a terrace. Guests can also relax in the garden. Laval is 40 km from Sauvignon, while Vitré is 37 km away. The nearest airport is Rennes Airport, 87 km from the property. Le Hutereau - Muscadet is located in Saint-Denis-de-Gastines and offers free bikes, a seasonal outdoor swimming pool and barbecue facilities. Featuring garden views, this holiday home also offers free WiFi. This holiday home comes with 3 bedrooms, a TV, and a kitchen with an oven and a microwave. Guests can also relax in the garden. Laval is 40 km from the holiday home. The nearest airport is Rennes Airport, 87 km from the property. Situated in Ernée, La Cachette is a traditional 3-bedroom cottage with exposed beams. Provided with free Wi-Fi access, the property blends antique and contemporary furnishings. Set on 2 levels, the cottage includes a fully equipped kitchen and a dining area. The spacious living room has a burner, a flat-screen satellite TV and a DVD player. On the upper floor, you will find 3 bedrooms (2 with private bathrooms) and an additional bathroom. A furnished terrace is at your disposal on site, as well as free parking. Set in Saint-Hilaire-du-Maine in the Pays de la Loire Region, 22 km from Laval, le Vallon des 5 Roses boasts a barbecue, children's playground and sun terrace. Free private parking is available on site. This eco-friendly wooden chalet is fitted with a flat-screen TV, a kitchen area and a dining area. A private bathroom with shower is provided. Le Vallon des 5 Roses boasts garden views and free WiFi. Farm animals are living on site. You can play table tennis at the bed and breakfast. Vitré is 24 km from le Vallon des 5 Roses, while Fougères is 27 km away. The nearest airport is Rennes Airport, 63 km from le Vallon des 5 Roses. La Bourdière is set 5 km from Landéan and 11 km from Fougères in the Brittany region and offers free Wi-Fi internet access. It features a wellness centre with a hot tub, sauna and fitness room, available at an extra cost. The guest rooms at La Bourdière have exposed wooden beams, parquet flooring and an en suite bathroom. Guests are invited to relax by the fireplace or watch TV in the shared living room. A continental breakfast is served every morning and includes homemade jam and crepes. Traditional evening menus with local products accompanied by drinks can be prepared upon reservation. Massage treatments can also be arranged on site. Free private parking is available at La Bourdière and exit 31 of the A84 motorway is 16 km away. The property is a 50-minute drive from Mont Saint-Michel and the centre of Rennes. Hotel Parigné Preferred hotel ! Holiday Home Villamee Le Champ Marie is situated in Villamée. Guests staying at this holiday home have access to a fully equipped kitchen. The holiday home is fitted with a TV, 1 bedroom and a living room. Le Mont Saint Michel is 36 km from the holiday home, while Avranches is 35 km from the property. The nearest airport is Rennes Airport, 69 km from Holiday Home Villamee Le Champ Marie. Set in Chailland, La Jameliniere has a garden and terrace. Boasting a shared kitchen, this property also provides guests with a restaurant. Free WiFi is available. At the guest house, the rooms are equipped with a desk. The private bathroom is equipped with free toiletries. All guest rooms will provide guests with a wardrobe and a kettle. The daily breakfast offers continental and gluten-free options. Guests can take part in various activities in the surroundings, including cycling and hiking. Laval is 24 km from La Jameliniere, while Vitré is 33 km away. The nearest airport is Rennes Airport, 78 km from the property. Guest accommodation Levaré Preferred hotel ! Located in Levaré, La Tabourie features accommodation with a private pool and private parking. This property offers access to a patio and free WiFi. This holiday home has 2 bedrooms, a living room and a fully equipped kitchen with an oven. A flat-screen TV is offered. A continental breakfast is served every morning at the property. Laval is 48 km from the holiday home, while Vitré is 46 km from the property. Rennes Airport is 84 km away. Set within 16,000 m² of park land, this restored 18th-century manor house is 38 km from Laval TGV Train Station. It offers en suite accommodation with free Wi-Fi access and far-reaching views of the countryside. All guest rooms at Château du Bourg have their own bathroom with a shower. An electric kettle is provided for making hot drinks. A continental breakfast is served each morning. Guests have access to a fully equipped kitchen that includes an oven and a dishwasher. There is a shared dining area and also barbecues and outdoor furniture for eating on the terrace. Free private parking is provided at the chateau. The A 84 motorway is 28 km away. Popular activities in the area include hiking and fishing. Below here is the hotels map of Luitré. Names and details of Luitré hotels can be shown on the map clicking on the prices icons.